Insect pollinators, both managed and wild, have become a focus of global scientific, political and media attention because of their apparent decline and the perceived impact of this decline on crop production. Crop pollination by insects is an essential ecosystem service that increases the yield and quality of approximately 35% of crops worldwide. Pollinator declines are a consequence of multiple environmental pressures, e.g. habitat transformation and fragmentation, loss of floral resources, pesticides, pests and diseases, and climate change. Similar environmental pressures are faced in South Africa where there is a high demand for pollination services. In this paper, we synthesise data on the importance of different pollinators as a basis for services to South African crops and on the status of managed honeybees. We also focus on insect pollination services for the Western Cape deciduous fruit industry, which is worth ZAR9800 million per year and is heavily reliant on pollination services from managed honeybees. We discuss landscape and regional level floral resources needed to maintain sufficient numbers of managed honeybee colonies. In summary, the available literature shows a lack of data on diversity and abundance of crop pollinators, and a lack of longterm data to assess declines. We highlight key areas that require research in South Africa and emphasise the critical role of floral resource availability at the landscape and regional scale to sustain pollinators. We conclude that understanding the dynamics of how floral resources are used will help inform how landscapes could be better managed in order to provide long-term sustainable pollination services. Despite the perceptions of global honeybee decline, long-term global data indicate an increase in managed honeybees,29-31 except in the USA. However, agricultural demand could outstrip supply of managed honeybees30 and greater demand for high value fruit and nut crops may further increase demand for pollination services.32,33 This demand implies that pollination services may experience constraints even without a dramatic decline in honeybees and highlights the need for effective strategies to safeguard reliable pollination services for agriculture. Such strategies could include: improved health of managed honeybees; identifying possible substitutes for managed honeybees14,34; increasing and diversifying the suite of wild pollinators where possible (see Corbet15); and increasing the effectiveness of wild pollinators26. The latter includes conserving suitable food sources and nesting habitat for wild pollinators within the agricultural matrix and raises the question first posed by Ghazoul35: 'Is management to secure biodiversity benefits more rewarding for crop production than management less favorable to biodiversity?' If so, then strategies to improve pollination services need to be aligned with strategies to conserve biodiversity in agricultural landscapes. Within South Africa, there is a high demand for pollination services for many crops. At the same time, our pollinators are exposed to similar environmental pressures that have resulted in declines elsewhere in the world, e.g. habitat transformation or fragmentation19,20, loss of diversity and abundance of floral resources36,37, inappropriate use of pesticides36,38, spread of pests and diseases17, and climate change5. As a result, it is important to understand the current state of knowledge in South Africa relating to pollination services. In this context, we review the literature of South African pollination services in agricultural systems to highlight issues and identify areas where further research is needed. Firstly, we review the importance of different pollinator species as a basis for services to South African crop production. Secondly, we examine if South Africa is experiencing similar declines in managed honeybees. Thirdly, we focus on the Western Cape deciduous fruit industry, an industry worth ZAR9800 million per year, which is heavily reliant on the provision of pollination services.89,90 Despite its economic importance, very little has been published on managed pollination services in South Africa. We review the current capacity, economic value and importance of the pollination services. Fourthly, we focus on the landscape and regional level dependence on floral resources to maintain sufficient numbers of managed honeybee colonies and what this may mean for sustainable pollination services. There have been few comprehensive assessments of pollinator assemblages on crops in South Africa and no studies on declines in these assemblages such as that done by Biesmeijer et al.4 for European systems. Nevertheless, studies on natural systems within South Africa have shown the negative effects of habitat fragmentation on plant-pollinator interactions within the agricultural matrix47,48 as well as the breakdown of specialist plant-pollinator networks on smaller conservation areas (reserves <385 ha).49 Furthermore, the impact of overgrazing on pollinators has also been shown to have negative impacts through the loss of host plants and trampling of nesting sites.50-53 Interestingly, Vrdoljak and Samways54 found that levels of flower visitor richness within agricultural mosaics can be similar to protected areas, suggesting the potential for natural or semi-natural habitat to facilitate movement of individuals and act as a repository for pollinators. Without long-term monitoring of pollinator populations to assess trends over time, little inference can be made about such changes in wild pollinator populations or their effects on pollination services. Despite the findings indicating the importance of wild pollinators, the role and contribution of honeybees (both managed and wild) within South African agriculture should not be overlooked. All but one study (Table 1) on mangoes55 found honeybees to be the most abundant pollinator (contributing on average 69.2±30.0% of observed insect visitors to flowers) in South African crop fields, including seed, deciduous fruit and tropical fruit crops. A high abundance of honeybees is not uncommon; honeybees are known to be present in many agricultural systems worldwide25,66 - either because managed hives have been used or because there are wild or feral honeybees55. Honeybees in South Africa are indigenous and ubiquitous in natural67-69 and agricultural systems5570 and are an important pollinator to a wide range of indigenous plant species68,71. Consequently, assessing the ecological importance of wild honeybees within the agricultural matrix and their contribution to sustainable pollination services is essential. However, doing so is not straight forward, as it would be impossible for researchers to distinguish between wild and managed honeybees as they are the same species.56,57 In order to determine the relative contribution of wild pollinators, including wild honeybees, researchers would need to (1) account for the presence of managed hives in their experimental design and statistical analysis (see Carvalheiro et al.55,56), (2) use isolated fields (greater than 5 km from neighbouring farms), preferably surrounded by natural vegetation, that do not have managed honeybees or (3) close up managed hives once they have been brought into the orchard or crop field. 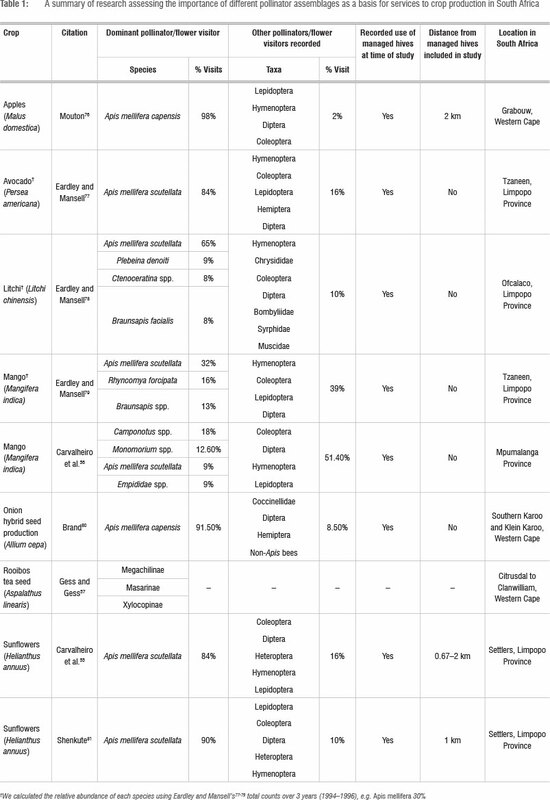 The limited amount of published research (Table 1) on the importance of different pollinator species highlights the need for further research on the diversity and richness of unmanaged pollinators (including indigenous Apis). The available literature indicates that honeybees are important, but because the wild component has not been quantified, the most effective pollination services appear to be derived from a combination of honeybees and other pollinators. Are there declines in managed honeybees in South Africa? In South Africa, managed honeybees have not experienced the same dramatic declines as recorded for North America and, to a lesser extent, Europe. They appear to have remained healthy despite the appearance of destructive bee pests such as varroa mite82 and diseases such as American foulbrood.83,84 It has been reported that South African honeybees exhibit traits of resilience against these pathogens.84 However, this tolerance of bee pests and diseases in honeybees is not yet fully understood84 and it would be premature to assume that honeybees in South Africa will not decline as a result of novel pests or diseases. Despite an absence of significant reports of colony losses, data on the number of honeybee colonies in South Africa are irregular and patchy, with the last census conducted in 1975.85,86 Added to this, the reduced capacity and limited budget available for the Agricultural Research Council to collect data on honeybees means that data on honeybee colonies are unlikely to improve in the short term. Pirk et al.87 conducted a beekeeper survey assessing the extent and the potential causes of colony losses in South Africa. Their study found colony losses (reported losses over two consecutive years, 2009-2010 and 2010-2011, of 29.6% and 46.2%, respectively) were higher than those considered acceptable in Europe or North America. Colony losses, specifically for beekeepers using A. m. scutellata, have, for the most part, been attributed to the A. m. capensis worker social parasite, a problem unique to South Africa. Losses of colonies were shown to be significantly increased by migratory beekeeping practices, in particular when beekeepers moved colonies to provide pollination services. Global analyses of long-term data have shown that the assessment of hive numbers in the context of demand indicates there has been an increase in pollinator-dependent crops33 rather than a decline in managed honeybees. Allsopp and Cherry88, and anecdotal reports a decade later, indicate that colony numbers in South Africa are constrained by access to and availability of floral resources and therefore have a limited capacity to cope with any further demand. The lack of suitable sites forces new entrant commercial beekeepers to buy out established businesses for these highly prized sites. Similar assessments, as done by Aizen et al.29, are needed in South Africa to determine if the current supply of managed hives meets current and predicted increases in demand for pollinator-dependent crops. Given the relative importance of pollination to deciduous fruit production in the Western Cape Province, the region provides an important case study for this review. South Africa is a major volume fruit exporter in global terms and the industry is valued at zAR9800 million per year.89,90 There is 77 805 ha under deciduous fruit production in South Africa and a little over half this area is concentrated in the Western Cape.89 Deciduous fruit growers are largely dependent on managed honeybees for pollination (specifically for apples, plums, pears and apricots).39 Approximately 87% of the honeybee hives in the Western Cape are used for pollination services82 and large commercial beekeepers transport their hives hundreds of kilometres to provide pollination services to the industry82,85. The Western Cape forms part of the Cape Floristic Region (CFR) - an area of distinctive biological diversity and rich in endemic species.91-93 It is currently estimated that 30% of the CFR has been transformed through agriculture, invasion by alien vegetation and urbanisation.91,92 The CFR is globally recognised as a significant centre of diversity for bees, one of the most important pollinator groups.94 Although agriculture in this region abuts natural vegetation, the contribution of other pollinators from natural vegetation appears limited, but has not been sufficiently quantified (Table 1). Estimates of the economic value of pollination services may be used to prioritise conserving habitat for pollinators in agricultural systems.96 There is a growing body of scientific literature on methods for valuing ecosystem services, many focusing on the value of managed honeybees as a proxy for wild pollinators, but as yet there is no consensus as to the most appropriate method.97 Within South Africa, there have been two studies39,95 valuing pollination services in the Western Cape Province. The direct cost of pollination services to the deciduous fruit industry is estimated as 1% of production costs,39,89 which is a considerable underestimate of its ecological value. Turpie et al.95 estimated the value of pollination services from managed honeybees to agricultural crops at ZAR1820 million.95 Using a different method, Allsopp et al.39 valued managed pollination services at ZAR46 million and wild insect pollination services at ZAR53 million (based on the 2006 exchange rate used by authors of ZAR6.74388 to USD1).39 Notwithstanding the need to agree on valuation methods, there may be more important economic questions that have not been addressed. These include the potential increase in crop production costs if there are constraints on managed honeybee numbers (as seen in North America where demand for pollination in almond orchards resulted in significant increases in honeybee rental costs2), as well as examining the true cost of pollination services across the supply chain from the provision of forage to crop pollination. Such valuations may better inform land-use planning for the provision of floral resources to ensure sustained managed pollination services. The major honeybee plants in the Western Cape, those yielding substantial quantities of pollen and nectar and which are important for colony replenishment, include indigenous vegetation (fynbos), stands of alien invasive species (Eucalyptus spp.) and cultivated crops (canola, citrus and lucerne).70,88 Interestingly, when looking at this managed system, we see that pollinator floral resources are derived not only from intact natural vegetation but also from human-modified vegetation. These floral resources become available over a temporal and spatial mosaic across the Western Cape. Therefore quantifying the importance of these key floral resources to maintain stable honeybee populations at a landscape or regional level is essential. It is also critically important in light of recent research showing that one of the possible causes of declines in managed hives in North America is a compromised or deficient diet.36101 However, it is apparent that in order to understand the complex ecological linkages that exist between the agricultural landscapes and the supporting ecosystem services for managed honeybees, an in-depth analysis is required. Fine-scale data on both the spatial and temporal nature of these resources, their extent, and their seasonal inter-dependence need to be considered when assessing the importance of floral resources. Not all floral resources are suitable for sustaining hives. Some sites have limited carrying capacities in relation to specific floral resources as a result of nectar flows, pollen availability or seasonality.102 Furthermore, there are management issues such as access (permission) to certain floral resources (e.g. fynbos in conservation areas71), vandalism of hives70 and high pesticide use70,88, which result in areas or sites being unsuitable or impossible for keeping honeybees. In the following sections we discuss the key floral resources used by commercial beekeepers within the Western Cape: crops, alien vegetation, indigenous vegetation and agricultural weeds (Figure 1). Each is discussed in terms of usage, seasonal availability and abundance (area/extent). Mass flowering crops, including Brassica napus (canola), have been shown to be important for sustaining bumblebee populations in Europe.65,103 Canola farmers, growing self-compatible varieties, may benefit from insect pollination which has been shown to increase seed set and seed quality.70,104,105 In the early 1990s, rain-fed canola production was introduced in the winter rainfall region of the Western Cape and grown in rotation with wheat-barley-lucerne.106 Canola has rapidly become an integral floral resource for beekeepers, particularly for those beekeepers who provide pollination services, as it allows colonies to build-up their strength prior to crop pollination. The high pollen and nectar content of canola stimulates an increase in brood production resulting in an increase foraging for pollen, which is ideal when hives are moved to farms for pollination, as active foragers should equate to better pollmaan.67,70,88 Canola is an important attractant for migrating/ absconding swarms, enabling beekeepers to trap new swarms (and replenish hive numbers). Currently, 45 000 ha of canola is planted in the Western Cape107; and this figure is set to increase.108,109 However, canola is produced in rotation with other cereal crops on a 1-in-5 or 1-in-10 year cycle,106 depending on individual farming practices, and not all canola fields are suitable for apiary sites because of heavy pesticide use which increases the risk of colony losses.88,104 As a result, it is challenging to predict the availability of canola in any particular year or its contribution to apiary sites in maintaining managed honeybees for pollination services. In the Western Cape, commercial beekeepers who provide pollination services depend on three species: E. cladocalyx, E. camaldulensis and E. conferruminata. Several Eucalyptus species have been classified as invasive species under the Conservation of Agricultural Resources Act (CARA) of 1983, resulting in programmes aimed at clearing these species.110 This clearance has raised questions regarding the benefits of these species to beekeepers (and hence agricultural production) relative to the costs associated with invasion; for example, a survey of Western Cape beekeepers found a significant dependency on CARA-listed Eucalyptus species.88 The Department of Environmental Affairs, which coordinates most of the invasive clearing through the Working for Water programme, has been sensitised to these issues and has supported various initiatives to improve the scientific basis for decisionmaking regarding Eucalyptus species, including research on the use of floral resources by honeybees (http://www.sanbi.org/programmes/conservation/pollination-and-honeybees). The evidence gained from these studies is expected to influence the listing of Eucalyptus species under the National Environmental Management Biodiversity Act of2004, which will eventually replace the CARA listings. To support the listings, as well as a more evidence-based approach to the management of Eucalyptus species, it is essential to have a proper understanding of the dependence of the beekeeping industry on these species. In 2004, it was estimated that the infestation of Eucalyptus species for the whole of South Africa (nine provinces) was 62 949 ha, of which 2264 ha was already cleared.111 These estimates have not been provided on a provincial basis and it is therefore hard to gauge the extent and availability of Eucalyptus species to beekeepers in the Western Cape during the summer months. It is also not clear whether beekeepers rely on eucalypt plants that grow in high-risk areas (riparian zones, mountain catchments and high fire-risk zones) or in areas where eucalypts can be retained with a low risk to the environment. However, based on beekeeper observations, Allsopp and Cherry88 reported that 60% of eucalypts were found to be on land with a low risk of invasion. Annual weeds such as Echium plantagineum (echium), Raphanus raphanistrum (wild radish), Plantago lanceolata (plantain) and Hypochoeris radicata (false dandelion), which typically occur in vineyards, farmlands and road verges, provide a minor nectar flow for honeybees (see Johannsmeier99 for a complete list of weeds). '^99119 Availability of weeds is highly variable70,119 and therefore considered a minor floral resource70,99. However, when available, weeds can offer an important source of pollen and nectar for sustaining hives.119 Pollen from echium and wild radish is reported to be exceptional in terms of crude protein content.119 Because none of these plants are cultivated or grown in abundance, it would be difficult to estimate their availability as a floral resource. In summary, our review shows the importance of pollinator richness for some crops and the concomitant need to maintain habitat within the agricultural matrix. Nevertheless, the evidence base linking pollinator richness (including indigenous Apis) to crop yield is still relatively weak for most South African systems. The available literature indicates that honeybees are important, but as the wild component has not been quantified, the most effective pollination services appear to be derived from a combination of honeybees and other pollinators. In addition to the need for accurate census data on managed honeybees, assessments to determine if current supply of managed hives meets current and predicted demand for pollinator-dependent crops are needed. Given the relative importance of pollination to deciduous fruit production in the Western Cape and the current demand for managed honeybees, we highlight potential constraints to increase capacity, such as limited access and availability of suitable floral resources. It is therefore necessary to estimate the potential increase in crop production costs if there are constraints on managed honeybee numbers and to examine the true cost of pollination services across the supply chain from the provision of forage to crop pollination. Such economic evaluations may improve land-use planning for the provision of floral resources to ensure sustained managed pollination services. We conclude that understanding the dynamics of how floral resources are used will help inform how landscapes could be better managed in order to provide long-term sustainable pollination services. • What is the contribution of wild pollinators, including wild honeybees, to particular crops? • Are managed honeybees constrained by available floral resources and, if so, what does this constraint mean for crop production in South Africa? • Where are the key floral resources in the landscape and can these be mapped and included in regional plans? • How can landscapes be managed to optimise the use of different elements to sustain pollination services? We thank the Western Cape beekeepers for valuable discussion and insights into managing honeybees. We acknowledge anonymous reviewers for comments and suggestions that improved the manuscript. This study was part of the Global Pollination Project in South Africa. A.M. is grateful for financial support from the gEf/UNEP/FAO Global Pollination Project and the Honeybee Forage Project funded by the Department of Environmental Affairs through SANBI's Invasive Species Programme. M.R. is supported by the South African Research Chairs Initiative of the Department of Science and Technology and the National Research Foundation of South Africa. A.M. wrote the first draft of the manuscript with contributions from M.R., J.J.M. and J.S.D.